I made this cake for my son for his birthday. 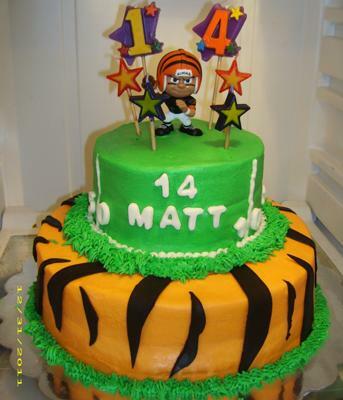 He loves football and the Bengals so it was a no-brainer to put the two together on his cake. The bottom layer is 9" rounds and frosted with orange buttercream. The top is 6" rounds frosted with green buttercream frosting, then stacked. I cut tiger stripes from chocolate fondant using a picture I found on the internet as a guide and place those on the bottom tier. I used a writing tip and white buttercream to put the football field markings around the green tier. Then, the numbers and letters were cut from white fondant with fondant cutters and placed on the cake. I added a white buttercream bead border at the base of the top tier. The tip 233 was used with green buttercream to put a grass border around the base of both cakes. The star and number candles were added to the top of the cake. The football figurine was added to finish off the cake. VALERIE, YOUR CAKE IS OUTSTANDING, WHAT A DARLING IDEA. I'M SURE IT WAS A HIT. LOVED THE TIGER LOOK. VERY GOOD WORK, KEEP IT UP, YOUR GOOD!!! Return to March 2012 Cake Decorating Contest Submission Form.